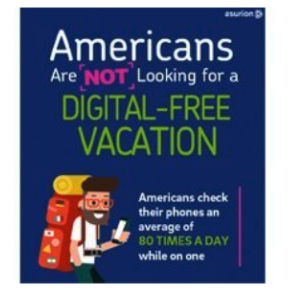 While Americans want to relax and get away from our daily routine, we don’t want a break from our phones, according to new research sponsored by global technology solutions company Asurion. 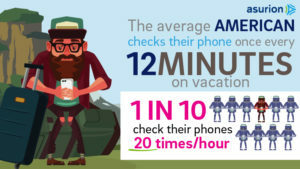 A recent study of 2,000 Americans found that Americans check their phones an average of 80 times a day while on vacation, with some checking their phone more than 300 times each day. Whether on a beach, by the pool or in a museum, average American checks their phone five times an hour – or once every 12 minutes while on vacation. And nearly 10 percent said they check their phones more than 20 times an hour. Four hours is the average time we can stand to be away from our phones while indulging in R&R. In fact, Americans are so dependent on our phones that one in four said they’ve either climbed a tree, hiked to the top of a hill, or canoed to the middle of a lake just to get mobile phone reception during vacation. And Americans will go to extreme lengths to get cell phone reception or squeeze in more screen time. 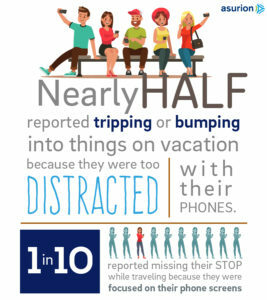 Nearly half of respondents reported tripping or bumping into things on vacation because they were too distracted with their phones. And more than 10 percent reported missing their vacation destination while traveling because they were focused on their phone screens. For more information or additional infographics, please contact Nicole Miller, Asurion Public Relations, @ nicole.miller@asurion.com. 1Random double-opt in online survey of 2,000 U.S. adults conducted in April 2018 for Asurion by OnePoll, a market research company and corporate member of ESOMAR and adheres to the MRS code of conduct.